The gods are falling out of favour with the humans, and the less prayers they receive, the weaker they become. Hades (Ralph Fiennes) and Ares (Édgar Ramírez) join together to imprison Zeus (Liam Neeson) to drain his power and awaken the Titans, thus ensuring their immortality. Zeus’s son Perseus (Sam Worthington) must journey to the underworld to free his father and save humanity. So it seems that the critical and fan rage that was unleashed on Clash of the Titans was not enough to stop there being a sequel to the horrific 2010 movie. The good news is that Wrath of the Titans is not as dreadful as it’s predecessor – and the awful tagline – would have us fear. The story is not incredibly interesting, and once it has been established that Perseus is going to go on a Homer-esque journey to the Underworld to free his father, this is pretty much what he does; albeit with a couple of detours and inconveniences along the way. The story for Clash of the Titans was painfully complicated, so at least this is one issue that has been resolved from the first film. Liam Neeson and Ralph Fiennes appear to be texting in their performances; there is no enthusiasm from either actor, and this appears to have rubbed off on the rest of the cast. Sam Worthington still has an Australian accent, which is just strange. Yes, it was explained in Clash of the Titans, but it is still jarring to hear a ‘modern’ accent in an ancient Greek tale. Other than that, Worthington is fine in the role of Perseus. He does not have a whole lot of charm, but this is something that he has carried over from the first film, so we are sort of used to this. Toby Kebbel is a new addition to the cast, and while he is supposed to be a loveable thief with a good sense of humour, this does not quite work and many of his lines fall flat. In fact, the only comic relief comes from the wonderful Bill Nighy who plays Hephaestus; the man who designed the Titans’ prison. Hephaestus has gone slightly mad from years of isolation, and Nighy’s ramblings are easily the best and funniest thing about the film. More good news is that the visuals have been improved for the film, and while the 3D still renders everything too dark, the film is actually a lot of fun, visually. The 3D has been embraced and the schlocky uses of the technology are all there; stuff flying at the camera, giant Cyclops’s jumping at the screen and a huge lava monster Titan thing. There is a great dream sequence near the start of the film that only incorporates the Titan’s hand, and it goes a long way to conveying size, scope and the fears of Perseus. Jonathan Liebesman, who has been named as director of the upcoming Ninja Turtles, focuses in on the action, giving the film a strong feel, but this means that the actual people and the emotional centre of the story suffers. Many of the live action characters come off as one dimensional and the pacing is off, so the film feels a lot longer than its 98 minute running time. In all, Wrath of the Titans is a definite visual improvement on Clash, but the audience is unable to empathise with the characters due to weak direction, the script has some unintentionally hilarious lines and the story has become so thinned out that the film feels like it is jumping from action sequence to action sequence. 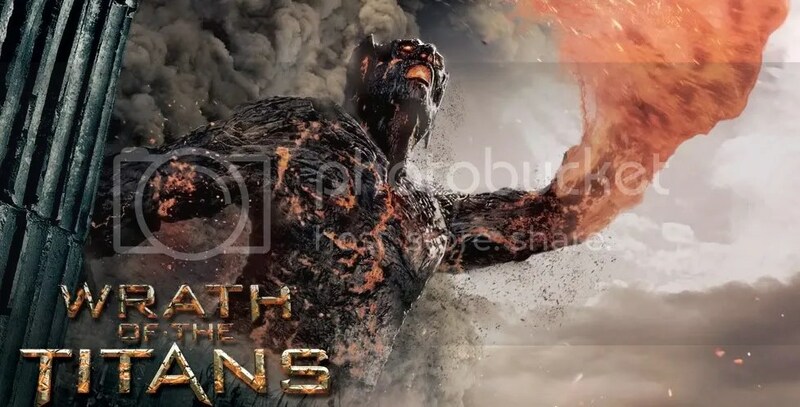 Wrath of the Titans looks darn good, but there is no real Wrath, unless you count the Titan sleeping with his mouth open for thousands of years, which would make anyone cranky when they woke up.